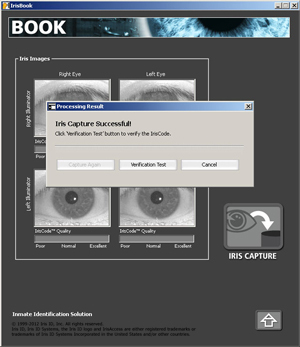 A speacially constructed authentication application for corrections that brings the speed and accuracy of iris recognition to accelerate the routine of correctional facility book and release without facilities while reducing risks of identity-related errors in transfer, or work-release management. A subject being booked is told to look into an IrisAccess iCAM4000 series camera. Digital pictures are taken of both eyes. The best images are selected and quality-graded, then verified, and turned into mathematical representations, or biometric templates. A data entry complete with digital picture is quickly made. Sending it to the database triggers the function that will automatically flag any existing iris enrollment in the system. The name, picture, and selected data from the database record is printed on a wristband at the touch of a button, and then placed on the subject’s wrist. 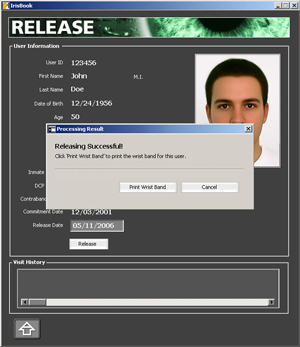 Confirmation of the individual’s identity is made in seconds with a quick glance in the iris camera; relevant details regarding the inmate’s name and release circumstances are automatically entered into the record and readied for printing on a new wristband. Simple System- Fast Identification INSiDE™, a new application from tool designed to make the routine of intake, release, and transfer of prisoners in and out of correctional facilities faster, easier and more secure than ever. Save time and money. The simple system requires only a PC, a printer, and one of the iCAM4000 series iris camera. Yet it can be integrated into virtually any jail management software. 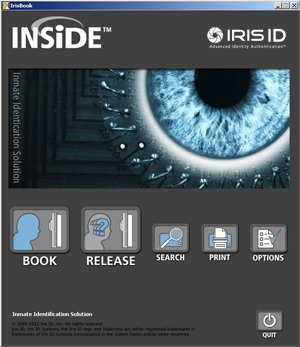 Proven Accurate and Reliable Now, INSiDE™ brings iris recognition, the most accurate biometric authentication technology into the booking, badging and release process and uses IrisAccess, the world’s leading deployed iris recognition platform, to do it. iDentityCheck™ Finds Alias- Past Activity INSiDE™ also incorporates an exclusive search capability called iDentityCheck™ that automatically flags previous history under a particular name – or even instantly recognizes activity under alias. It also captures multiple face images associated with each iris record. Wristband Print-Enabled The INSiDE™ system is designed to identify individuals and help others identify them also. 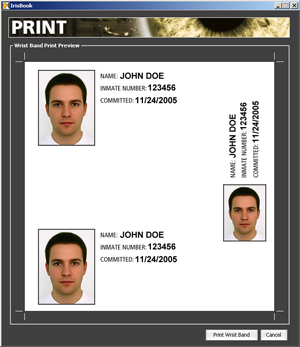 Digital face pictures taken at booking and information about subjects from the database entry can be printed on a wristband for placement on a subject’s wrist.